Shaurya Chakra is usually awarded to armed forces and para-military personnel for 'gallantry otherwise in the face of the enemy'. During the intervening night of October 16-17 of 2017, terrorists cordoned off the house of Sheikh. His father Mohammad Ramzan was an ex-sarpanch with affiliations to the People's Democratic Party. 'Sensing that the militants could harm his family, he exhibited highest degree of courage and faced the militants for sometime so as to avoid their entry inside the house. IMAGE: Sheikh was bestowed with the Shaurya Chakra for foiling an attack by three terrorists on his house in 2017. 'In meantime, his father came out and the militants pounced on him, resulting in scuffle,' the citation for the award read. The terrorists also resorted to indiscriminate firing, resulting in severe injury to Sheikh's father. He later succumbed. However, Sheikh did not lose courage and continued to engage in scuffle with one of the militants, who resorted to indiscriminate firing resulting in severe injuries to the terrorists as well. 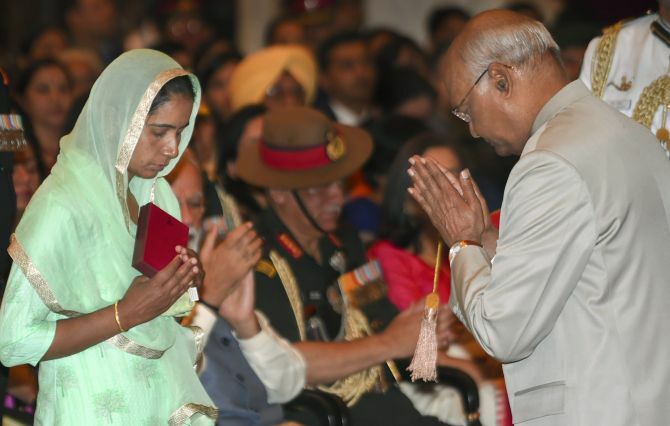 IMAGE: Wife of late Sepoy Vijay Kumar of the Indian Army recieves Kirti Chakra conferred on him posthumously. Kumar was martyred during counter-terrorist operation in Jammu and Kashmir. On seeing one of their associates injured, the terrorists tried to flee. However, Sheikh chased them and they left the body of their fellow behind. 'Irfan Ramzan Sheikh exhibited the extraordinary show of bravery and maturity in such a small age,' the citation read. 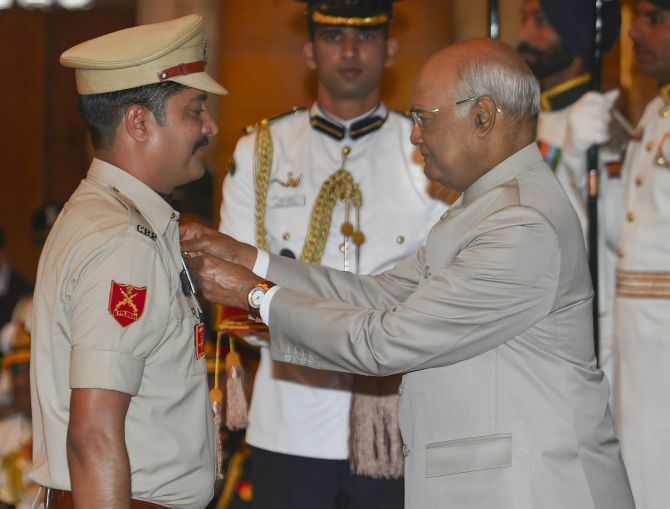 IMAGE: President confers Shaurya Chakra upon Kuldeep Singh Chahar, Deputy Commandant 182 Battallion of Central Reserve Police Force. 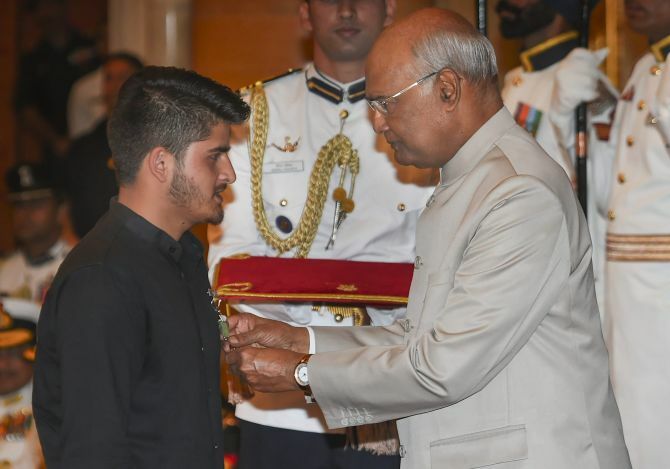 The President also awarded two Kirti Chakras and and an equal number of Shaurya Chakras posthumously to soldiers who laid down their lives in Army operations in Jammu and Kashmir and the Northeast. 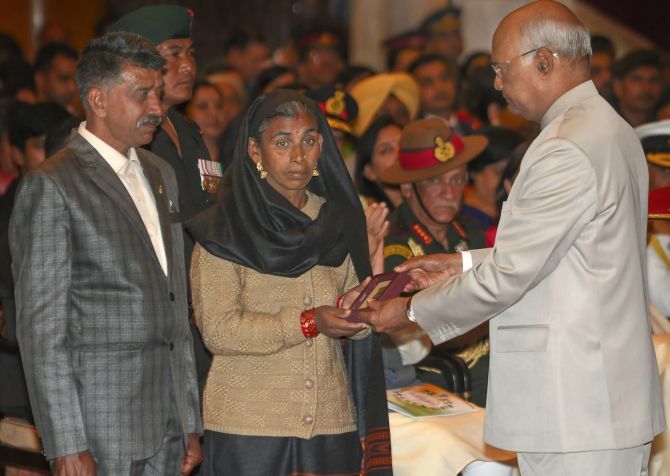 IMAGE: Parents of late Sepoy Ajay Kumar of mechanised infantry/42nd Battalion, Rashtriya Rifles, receive Shaurya Chakra conferred on him posthumously. 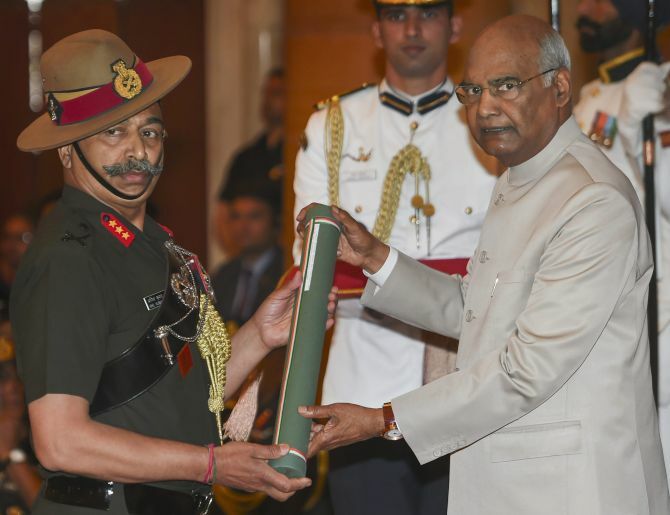 IMAGE: President confers Uttam Yudh Seva medal upon Lieutenant General Anil Kumar Bhatt for successful counter-terrorist operations conducted under him in Jammu and Kashmir. 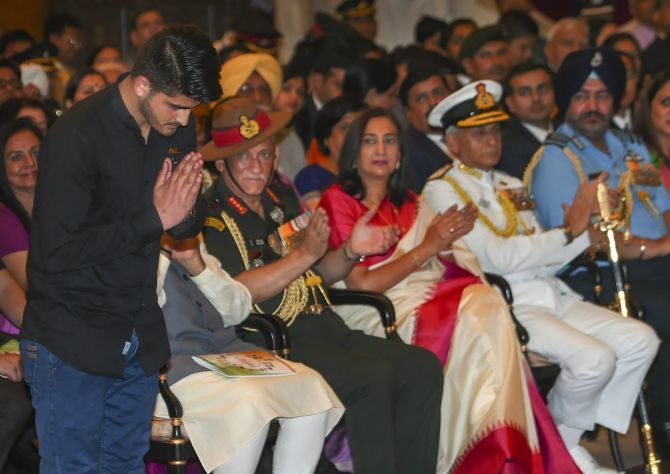 Kirti Chakra is awarded for 'conspicuous gallantry otherwise than in the face of the enemy' while Shaurya Chakra is awarded for 'gallantry otherwise in the face of the enemy'. 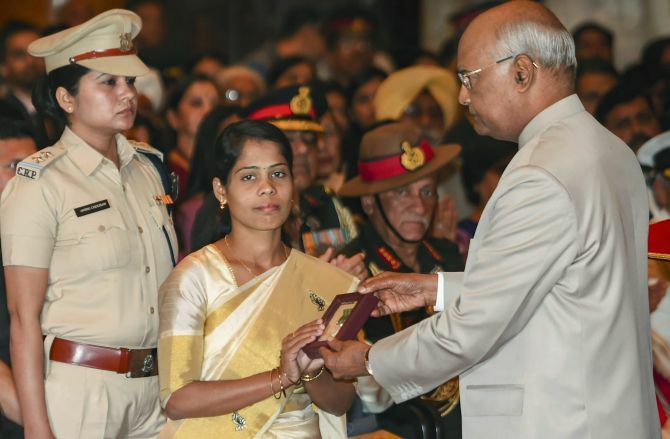 IMAGE: Wife of late Constable Pradip Kumar Panda of CRPF accepts Kirti Chakra conferred on him posthumously. The PVSM is awarded to officers for 'distinguished service of the most exceptional order'. The UYSM is awarded to officers for 'distinguished service of an exceptional order during war/ conflict/ hostilities' while AVSM is conferred to armed forces personnel for 'distinguished service of an exceptional order'.